In recent years, Twin Rivers Paper employees support their community by raising money on a weekly basis. In 2014, employees donated $9,000 to nearly fifteen community organizations. Proud of the accomplishment, fundraiser leaders confirmed that this recent activity has undergone several transformations over the years. After realizing the potential of this effort combined with the fact that Twin River’s employees wanted to invest in the community, the fundraiser has continued to grow. In 2012, the amount raised was $4400, while in 2013, Twin River’s employees raised $6,600. The fundraiser leaders take suggestions from employees and meet to determine how the donations will be given away. 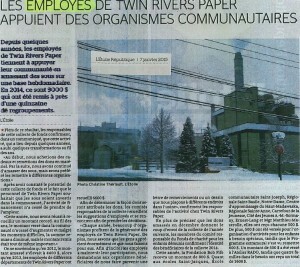 “Every year, many organizations benefit from the generosity of Twin Rivers Paper employees. Additionally, we know that people greatly appreciate our efforts. To encourage employees to participate, we post thank you letters and drawings from donation recipients at various locations in our operations,” said the fundraising organizers at Twin Rivers. Donations raised in December kickoff the collection for the following year. Members of the fundraising committee shared the donation recipients for 2014. This year, Bob Fife Foundation received $800. Each of the following schools received $500; namely, Saint-Jacques School, Saint-Joseph Community School, Saint-Basile Regional School, Notre-Dame School, Centre d’apprentissage du Haut-Madawaska, Sainte-Anne Regional School, Carrefour de la Jeunesse, Cité des Jeunes A.-M.-Sormany, Ernest-Lang and Matthieu-Mazerolle. Additionally, $500 was given to an organization for children with special needs and the Extra-Mural Program was awarded $600. An amount of $500 was given to the Atelier RADO (food bank, clothes, etc… for needy families), while four families in need received a combined total of $1,600.